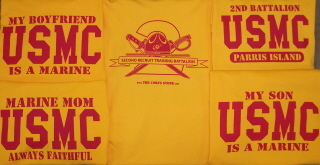 2nd Battalion Parris Island T-shirt has the battalion logo on the back. The family t-shirts also have the battalion logo on the back. Select from: My Son is a Marine, My Step Son is a Marine, My Son-in-law is a Marine, My Brother-in-law is a Marine, Marine Mom, Marine Dad, My Grandson is a Marine, My Brother is a Marine, My Nephew is a Marine, My Cousin is a Marine, My Husband is a Marine, My Boyfriend is a Marine, My Friend is a Marine or Marine Wife t-shirts. Also for families with multiple service members, My Sons are Marines, My Brothers are Marines, and My Grandsons are Marines! Sizes small to 3XL available with no additional charge for larger sizes! AVAILABLE ONLY AT THE CORPS STORE!!! !